“GOD Has Blessed My Life” from Christian Faith Publishing author Ronald L. Beason emotionally tells the story of the author, including the heartache, joy, passion and love that was endured. “GOD Has Blessed My Life”: a fascinating narrative of Mr. Beason’s life, from the years of adolescence, to joining the military, raising a family, retiring and everything in between. The author endured many struggles, but with the love and blessings from God, it was the fullest life he could have asked for. “GOD Has Blessed My Life” is the creation of published author, Ronald L. Beason, a devoted husband, father, grandfather and son. Ronald was a member of the United States National Guard and a retired mine inspector from Utah. 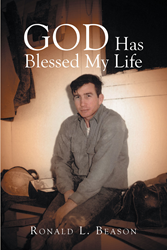 Published by Christian Faith Publishing, Ronald L. Beason’s new book dives into the life of a mine inspector, who had to learn the balance between work, family, God and never once questioning whether or not blessings were present during everyday life, for the answer was always nearby. View a synopsis of “GOD Has Blessed My Life” on YouTube. Consumers can purchase “GOD Has Blessed My Life” at traditional brick & mortar bookstores, or online at Amazon.com, Apple iTunes store, or Barnes and Noble. For additional information or inquiries about “GOD Has Blessed My Life”, contact the Christian Faith Publishing media department at 866-554-0919.